This Breathtaking Christmas Decoration is a sight to see this holiday season. With 200 glowing lights and a delicate dove, this Christmas Angel is a vision of true beauty. A magnificent Christmas decoration for the home, outdoors, or at the office, this empowering 60” angel is the ideal Christmas gift for loved ones near and far this holiday season. All decked out with an innocent halo and glorious golden wings, our lovely Christmas angel is dressed in a flowing white gown made of swirled fabric for a touch of elegance and charm that is certain to be remembered. This enchanting angel is the perfect addition to your garden display, and is created to withstand snow and wet weather. An end to end power connection makes it a breeze to connect your mystical angel to your other holiday décor. The golden trimmed sash around her waist and golden wings and halo make her a true focal point during the day, and her 200 light illumination is certain to get the attention of passersby after nightfall. 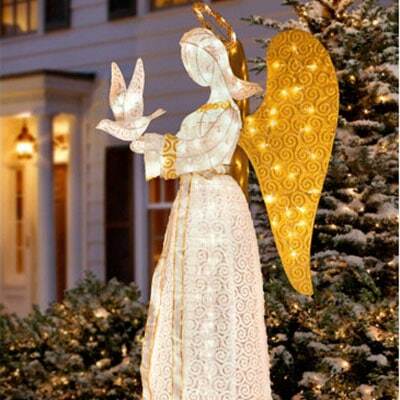 The 60″ Christmas Angel with Dove would be a great gift for my Mom. She loves angels. The Christmas Angel is so beautiful.